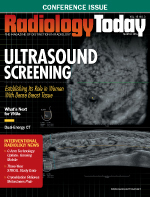 Radiologists, product developers, and health care administrators alike are navigating their way through some unfamiliar territory as ultrasound finds it place in the screening process for women notified that they have dense breast tissue. Ultrasound usage appears to be increasing as states pass notification laws and a national bill has been introduced in the House of Representatives. However, questions regarding insurance coverage, coding, and reimbursement for ultrasound used as a breast cancer screening tool could throw up roadblocks to its widespread adoption. Some limitations of handheld ultrasound are being eased with automated breast ultrasound (ABUS) systems, one of which is FDA approved for use in screening asymptomatic women with dense breasts. In 2012, the FDA approved the somo-v ABUS system developed by U-Systems, now a GE Healthcare company, for breast cancer screening as an adjunct modality to mammography for asymptomatic women with dense breast tissue. ABUS may work better in a high-volume breast cancer screening environment, with the average ABUS study usually taking one to three minutes. Jacob, who also serves as vice president of medical affairs for U-Systems, notes that mammography remains the gold standard for breast cancer screening, and women should follow their physicians’ recommendations when it comes to scheduling regular screening mammograms. Women informed that they have dense breast tissue should talk to their physicians about the specific risks and additional screening that may be appropriate. Jacob’s patients with known dense breast tissue undergo their annual screening mammogram and ABUS in the same visit. If dense breast tissue is discovered for the first time during a patient’s mammogram, she is offered ABUS the same day. “You don’t want to have to call back a patient to have supplemental imaging done after she’s already been to the office for her mammogram,” Jacob says. Vincent Giuliano, MD, DABR, medical director at VinCon Diagnostic Center in Winter Springs, Florida, uses the somo-v ABUS system as a breast screening modality in his practice. When he incorporated ABUS into his practice in 2009, it was as a diagnostic tool. However, with more emphasis on dense breast tissue today and the device’s approval for screening purposes in women with dense breasts, he now uses ABUS as part of a breast screening routine for some patients, even though Florida has yet to pass breast density notification legislation. Giuliano conducted a study published last year in Clinical Imaging that reviewed the use of volumetric breast ultrasound (VBUS) in detecting nonpalpable breast cancers in dense breasts when used as an adjunct diagnostic modality to mammography in asymptomatic women. The study looked not only at the ability to detect cancers with a screening ABUS in women with dense breasts but whether this is a cost-effective alternative. The study compared the incremental costs of screening vs. the costs of added treatment related to a change in the staging of missed cancers from stage I to stage II. Jacob practices in California, where dense breast notification legislation was passed in 2012. She was a proponent of telling patients about their breast density prior to the law, but finds now that, with the publicity surrounding breast density, more patients are asking her whether they have dense breasts. She encourages women to have this conversation with their physicians. Siemens’ automated breast volume scanner, ACUSON S2000, is approved for use in a diagnostic capacity, according to Jeffrey Stoll, director of global marketing for the company’s ultrasound division. This 3D imaging device provides coronal views that assist in visualizing lesion location and size as well as analysis of volume data and semiautomatic reporting. He says demand for breast ultrasound is increasing in the United States, which he attributes to greater awareness of breast density. In his role as chair of the Coverage Committee of the Medical Imaging and Technology Alliance (MITA), Frank sees a trend in more states passing dense breast notification legislation and, while he agrees with the concept, he believes that it would be better handled with a national standard. It’s difficult to inform the medical community and patients as to what’s best when the law addresses dense breast notification in different ways. Some states are vague about next steps for the patient. In addition, only four states mandate insurance coverage for supplemental screening imaging, creating an unfunded mandate in some states, he says. Frank says one of the MITA committee’s top projects for 2014 is support of a breast density reporting amendment to the Mammography Quality Standards Act, to be issued as a Notice of Proposed Rulemaking. He sees adoption of this amendment as a “signpost for product development and physicians” involved in breast imaging. In addition to changes in federal regulations as they pertain to breast imaging, there is another nationwide initiative—the federal Breast Density and Mammography Reporting Act of 2013—which is in committee. Kelly, along with fellow breast imager Judy Dean, MD, a diagnostic radiologist with Santa Barbara Women’s Imaging Center in California, made the conscious decision to use ultrasound as a screening tool long before legislation was enacted. In the case of both practitioners, their goal is finding small cancers in women, and each envisions ultrasound as the logical next step after mammography. By adding an automated aspect to ultrasound, the process becomes more uniform patient-to-patient, they say. Dean also finds consistency in the ability to store data in a PACS, a feature of the SonoCiné device. When patients make their annual mammogram appointments, it’s easy to pull up their records and see that, if they also have dense breasts, they need to schedule ABUS. This also allows for comparison of images from year to year. “This enables women to undergo their screening all in the same day,” she says. Creating a multimodality approach to breast imaging is what Jacob sees in the future for breast cancer screening in the United States. Women with dense breasts will undergo mammography and ABUS or other imaging components, such as tomosynthesis or MRI. That all-inclusive future also should include increased communication among all medical parties involved in a woman’s care, Frank says. He advocates a “more sophisticated delivery network” to educate patients on the topic of breast density. That information stream should include all entities of an integrated delivery system—community hospitals, tertiary care centers, physician offices, and clinics—so that all parties involved maintain a consistent solution to women’s imaging needs.